a small eyelid mass resulting from chronic inflammation of a meibomian gland; it can sometimes be treated at home with the application of hot compresses, but while this method is usually successful with a sty, a similar infection that has not yet formed a cyst, chalazion often requires incision and drainage. Called also meibomian cyst. /cha·la·zi·on/ (kah-la´ze-on) pl. chala´zia, chalazions [Gr.] a small eyelid mass due to inflammation of a meibomian gland. A cyst of a tarsal gland. 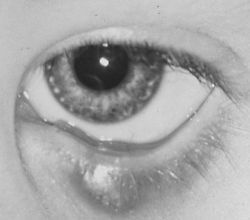 a small, nonmalignant, localized swelling of the eyelid resulting from obstruction and retained secretions of the meibomian glands. Treatment can include warm wet compresses, but the condition often requires surgery for correction. Compare hordeolum, sty. A hard, pea-like swelling in an eyelid, often becoming inflamed, and due to the retention of secretion in a MEIBOMIAN GLAND. Also known as a meibomian cyst. n nonmalignant swelling in the eyelid area due to an obstruction of or malfunctioning meibomian gland. a small eyelid mass resulting from chronic inflammation of a meibomian gland. Called also meibomian cyst. Keywords: Chalazion, Extralesional injection, Intralesional injection, Triamcinolone acetonide. When the lid is everted, the conjunctiva over the chalazion is seen to be reddened and elevated. 3%), punctate keratopathy in 32 eyes (67%), chalazion in 24 eyes (50%), corneal neovascularization in 24 eyes (50%), and peripheral subepithelial infiltrates in 8 eyes (16. Four of the patients had been initially misdiagnosed with conjunctivitis, one with nasolacrimal duct obstruction (NLDO), and one with chalazion. 8] Correct clinical diagnosis is very rare and differential diagnosis includes epidermal cyst, dermoid cyst, cysticercosis, sebaceous cyst, sebaceous adenoma or carcinoma, capillary hemangioma, chalazion, rhabdomyosarcoma, and so on. Associated with such changes, there is an increased risk of corneal abrasion, blepharitis, chalazion and hordeolum in TBI, while subconjunctival haemorrhage and ptosis are more prevalent in CVA. A chalazion is a nodular cyst resulting from the blockage of a meibomian gland. Slit lamp examination revealed left lower lid subconjunctival swelling resembling a chalazion measuring 10mmX15mm with a pointing tip associated with conjunctival congestion. Herein, we present a 69-year-old male patient with a giant tarsal keratinous cyst of the right upper eyelid who was misdiagnosed as chalazion of the eyelid. KERATITIS; TREAT HSO; TREAT 2 CRVO, ISCHAEMIC 3 CHALAZION ACUTE INTERNAL HORDEOLUM 4 ACUTE INTERNAL HORDEOLUM 5 C.